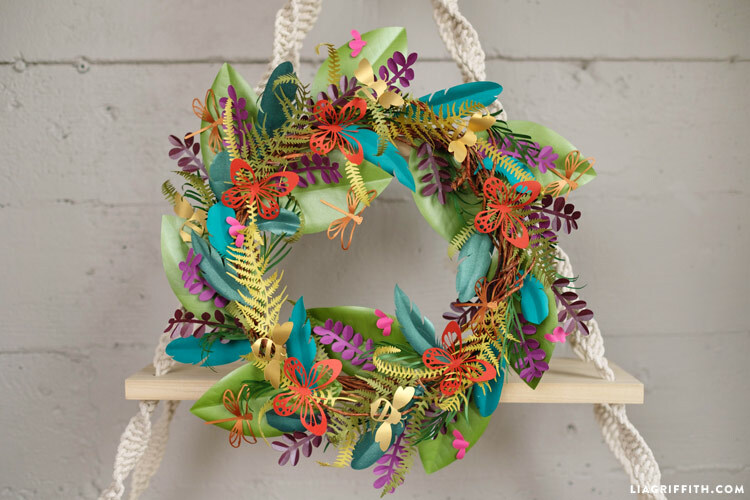 A Wildly Whimsical DIY Wreath to Refresh your Home Decor! We love wreath projects because they are an easy way to add a festive touch to your home decor. 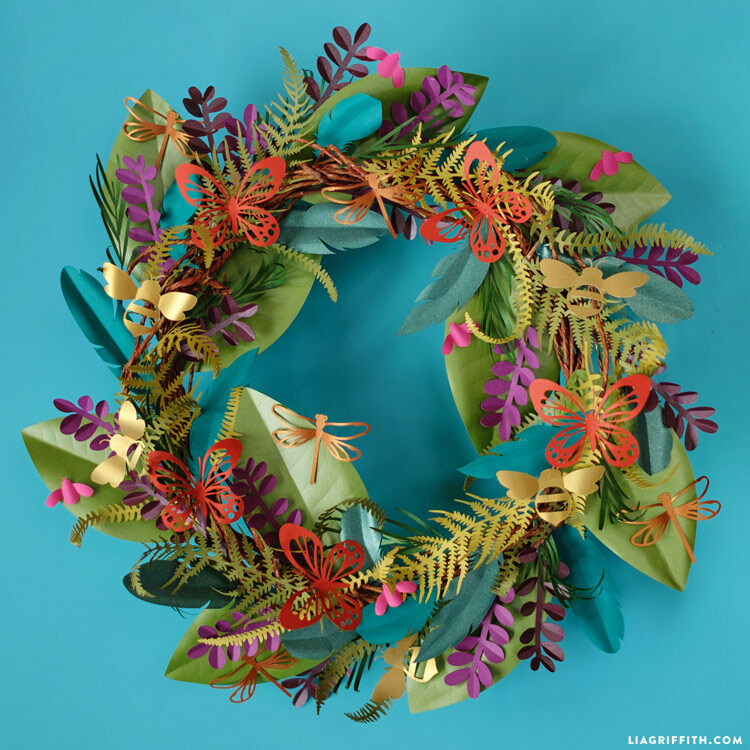 You can create seasonal wreaths that pay homage to a holiday or time of year, or you can create non-seasonal wreaths that inspire your creative side. Wreaths are easy to keep for years to come, and you can switch them out to refresh your home decor throughout the year. The beauty of creating a DIY wreath is being able to add personal elements that reflect your individual style. 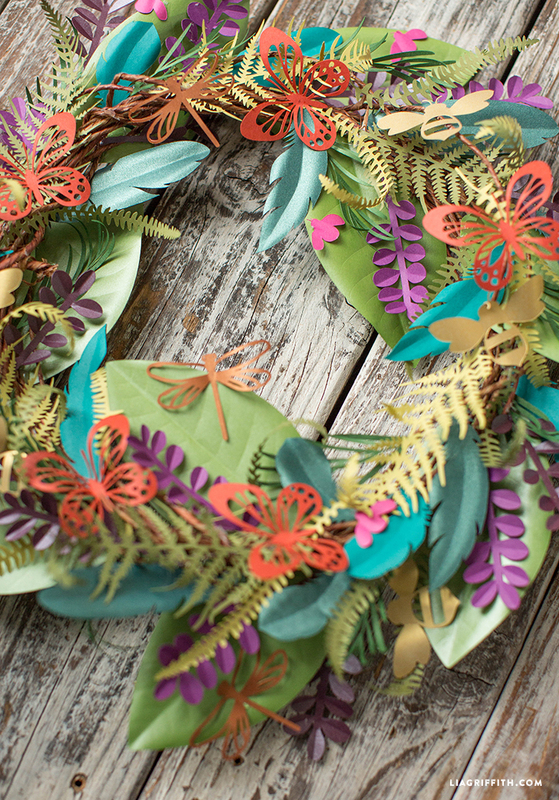 Our boho botanical paper wreath is featured in the January 2017 special edition issue of Mollie Makes Creativity, and it is beautiful for anyone wanting to indulge in their wild side! To make this wreath you will need a wreath form and some pretty papers of your choice. We decided to make our own wreath form using paper covered floral wire. This way, you can easily customize the size of your wreath. Wrap the wire about 5 times to create the wreath form, and then pick out your papers. We used a mix of text weight metallic papers from Paper-Papers.com and Paper Source. 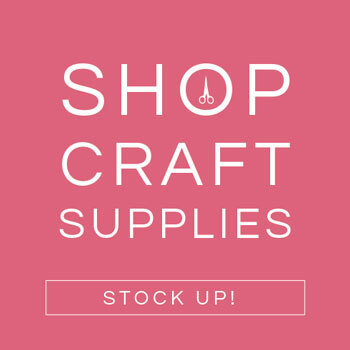 Find links for the papers in Shop this Project below! 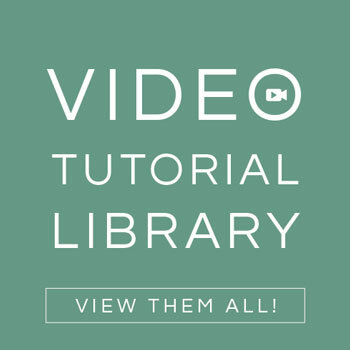 Once you have your materials, download our templates. Use the PDF version if you are cutting by hand, or the SVG version to use with a cutting machine. 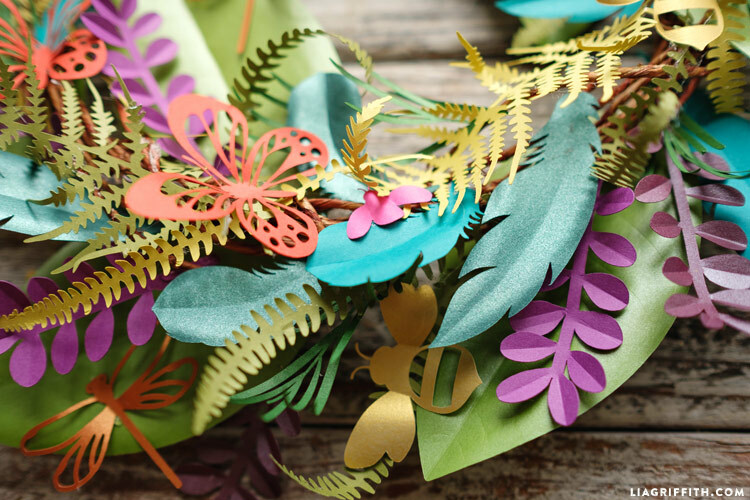 Just like with all homemade wreaths, our boho botanical paper wreath is a design that you can personalize in so many different ways. Fill out the wreath however you’d like! Generally, our main suggestion is to make sure that you build out the wreath so that the details are pointing in the same direction, whether that’s clockwise or counter-clockwise. 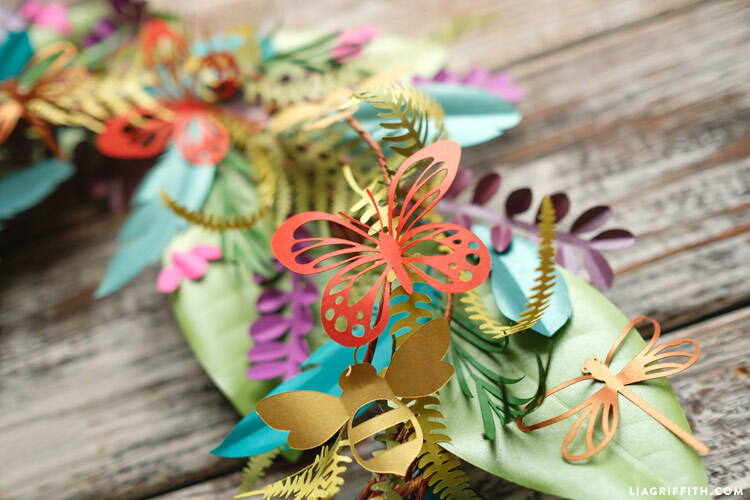 Use your hot glue gun to attach the bits and pieces, and feature any color palette that matches your style or home decor. Have fun with it! Hi Carolina! Could you please send an email to hello@liagriffith.com? We’ll get this figured out! So this wreath is not compatible with the cricut maker? I had the Cricut helpline try to help me get this project/svg to cut on my Cricut maker and we were unsuccessful. 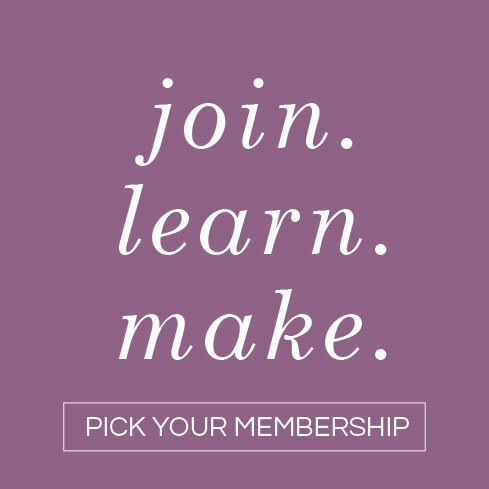 We cut this on the Cricut, so it’s very compatible 🙂 Send an email to hello@liagriffith.com with more details (the error message you’re receiving, and screenshots if you can!) and we can help you! 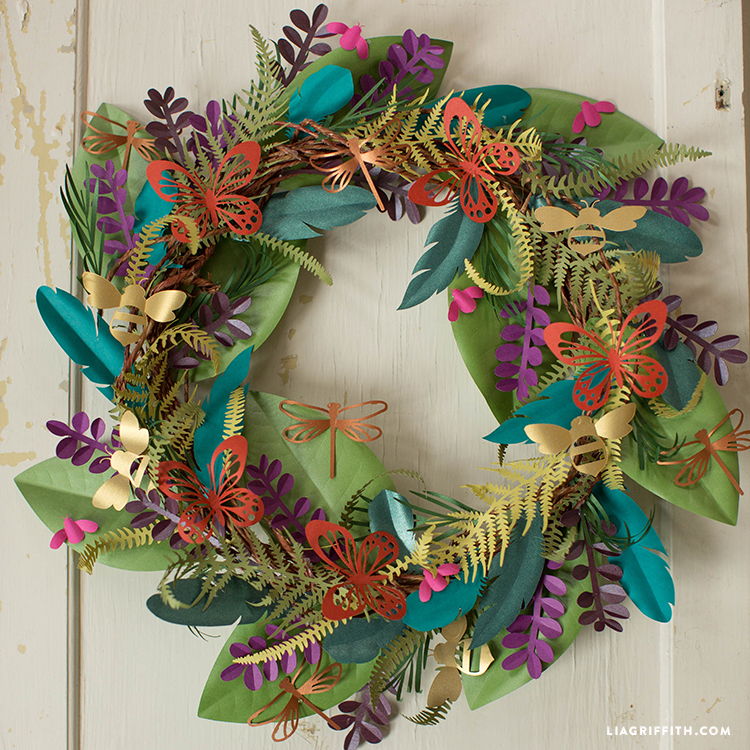 Is there a kit for this wreath… With all of the paper, etc? The least amount you can order of the paper is 10 sheets and since I rarely do paper projects it would be such a waste and also kind of expensive to order all of the paper colors individually. This wreath is beautiful and I would love to make it. Thanks! No, we only have a few specific flower kits made that are sold in JoAnn stores. You can use any color paper you want though, and can always shop at a local craft store that sells papers individually! Any other directions for the wreath form? I don’t really understand making it myself, and really want to make this wreath. 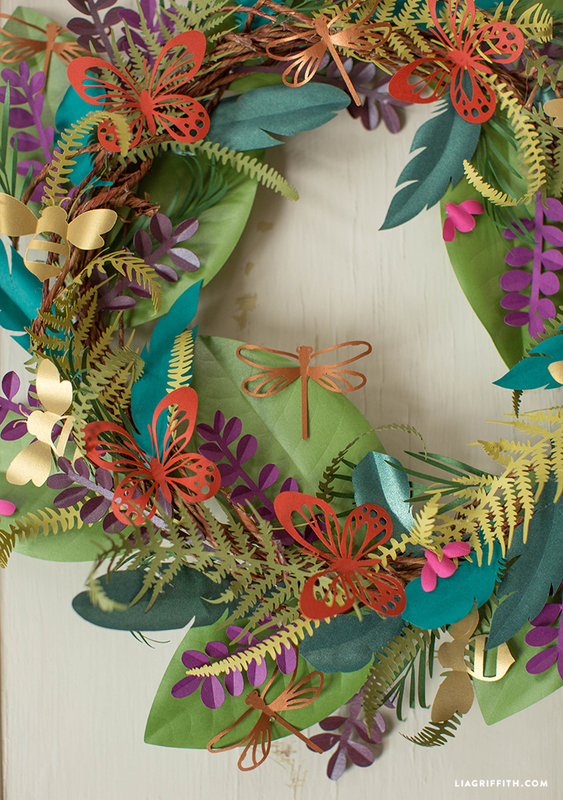 I have the paper and cricut, am stumped on the wreath… what size if i do foam? Or should I use something else? I did not find a paper color “charter” at paper source. Was this possibly discontinued? Which color is that in your photo? The only one I can see that is unaccounted for is the yellowish fern leaf color. Where do we find a littler more directions such as how many sheets of each color, what are the colors and what we cut from each color? I am new to this but think it is beautiful would love tomke it with my new cutting machine. Oh my this is sooooooo cool….love, love, love it!!!! The colors are just beautiful together.